It’s 2 a.m. My eyes are bleary, my arms and legs tender from a lack of sleep. My dog can hardly keep her head upright, whether she is indoors or out, and my man looks once more longingly at the sky, as I do. This is how we appear after a night of Aurora Chasing, a spell of searching the north for the Aurora Borealis to dance in the night sky. We are new at this, having only been actively seeking the Northern Lights since March of this year. Thus far, we have endured several duds, a few near misses and more than our fair share of overwhelming cloud cover. With each attempt, we grow more knowledgeable and more determined, our enthusiasm brewing hotter and longer throughout every hunt. The Aurora, though, are a mysterious and elusive lot. After decades of fine-tuning space weather forecasting, scientists at the Geophysical Institute and elsewhere still can’t predict with certainty the hours when Aurora will lower their veils beneath the Earth’s atmosphere. Values like the Kp Index, the direction of Coronal Mass Ejections and the Bz component on the Solar Wind Dials all work in tandem to affect whether the Aurora will appear each night. There are many more components than these, that when combined with a spotty weather forecast and the observer’s ability to stay up through the peak hours, make Aurora Chasing a very tricky pastime. As a lover of nature and genuine beauty, I find the Aurora fascinating. Over the years, I have fallen in love with the Boreal Forest of Minnesota and the tranquil lakes that reflect the moon and the stars from the forest floor. I have admired the coniferous forests from the highest peaks, stood in the mist of serene waterfalls, and watched the Milky Way and its sprawling stars climb into view. I have hiked hidden trails, canoed over windswept lakes, built driftwood fires on rock beaches, and lifted agates out of the icy waters of Lake Superior. One moment to the next, I have been awed by the beauty of this natural wilderness. Chasing the Aurora is an exciting complement to these adventures. Just the thought of an ethereal light show wildly streaking across a starry sky… It defies words. It took me five years of living in this beautiful state to realize Minnesota is one of few states in the continental U.S. where the Aurora Borealis can frequently be viewed. Locals insist that it often appears in bitter cold weather, making the Northern Lights one of the distinct advantages of living in the northern-most state in the country. And because the Aurora are more easily seen in the winter, peaking in the early spring or late fall, the natural wonder can soften the edge of what is sometimes a very challenging climate. Because of the massive quantities of light pollution and other factors, I’m sure I will never see the Northern Lights from the Twin Cities Metro or any of its nearby suburbs. I’ve spent the last few weeks studying light pollution maps, and unless an abnormally strong solar storm hits, here any attempted viewing would be a miss. Instead, the chase offers a great excuse to travel to the more natural areas of the state and take in the beauty of our untamed northern wilderness. I have always loved seeing the Aurora in photographs, noting how the bright and dynamic gases dance playfully through the darkened sky. But it wasn’t until April 24th, 2012, that the natural phenomenon piqued my interest — or April 25th, to be more precise. On April 24th of that year, the Aurora danced so brightly and in so many locations around the globe, it made news headlines everywhere. National Public Radio, CBS and The Huffington Post all covered the event, sharing photos taken around the world and a video taken right here in Minnesota. I didn’t see the photos until the evening of April 25th, when I became transfixed by the images on my computer screen. Aurora were depicted in an astonishing array of shapes, patterns and colors, ranging from neon green swirls of light to arches of red, purple and blue. The timing was a thing of significance, too. At least for me. The heavenly phenomenon had visited Earth on the one-year anniversary of the day my twin brothers, age 13, my mother and my stepfather were killed in a car crash. Upon seeing the photos, even though it had been a devastatingly difficult time, I remember feeling uplifted. And in fact, an Eskimo tale — one of the many legends about the Aurora Borealis — explains the Aurora as children who have passed away, returning to dance in the nighttime sky. Another legend describes the Aurora as our ancestors, descending upon the Earth to check on their families. “On Angel’s Wings” by Root River Photography. On April 24, 2012, the Aurora Borealis appeared in Minnesota in the shape of angels, igniting my passion for Aurora Chasing. 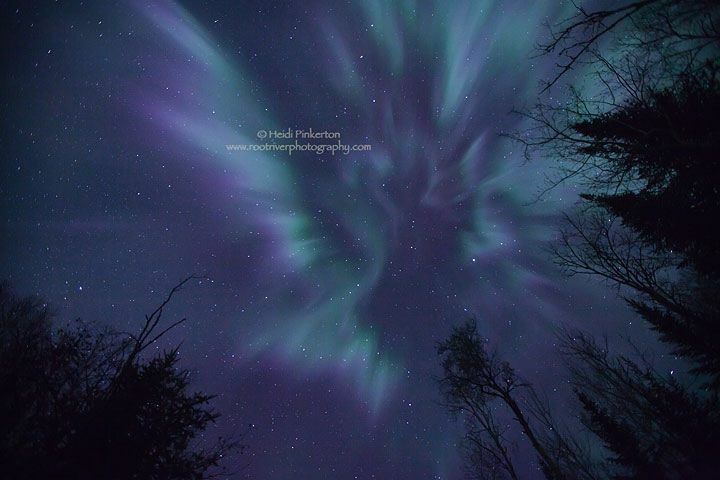 Photo courtesy of Heidi Pinkerton, Root River Photography. One photograph in particular has stayed with me through all this time. Though the Aurora appearances were vastly varied that night, forming everything from elaborate waves to distinct vertical columns (according to the photos), one photographer captured a sprite that looked remarkably like an angel. The photographer herself named the image as such, calling the photo On Angel’s Wings. I was touched by the photo then, and I am touched by it now. It, too, defies words. It is also an inspiration. The Aurora are an inspiration to keep going, to keep having adventures, and to keep searching for answers. Or at the very least, to keep searching for peace. For me, Aurora Chasing has become as much a personal interest as it has a spiritual journey. It is a challenging endeavor that requires passion, patience and persistence — even empathy for your partner or your dog, when they get too cold standing in the dark in a deserted park. It is an activity deeply rooted in both legendary folklore and modern science. And it is a journey to discover a stunning natural phenomenon that depicts the rare beauty visible from this Earth. I don’t know how I will feel when I see my first Aurora, but I know it will be exciting! And I know that being surrounded by all of God’s natural beauty, whether earthly or ethereal, brings me a true feeling of peace. For more of my writing, visit my blog. The original post was published there on June 10, 2013.